48 spokes. Classic cross lace style with large center cap. From Truespoke. 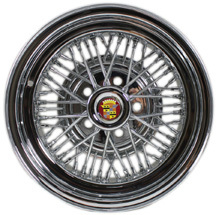 60 spoke, straight lace with Cadillac hubcap. Exclusive design. From Truespoke. 50-spokes. Formerly sold by Cadillac dealers since 1974. 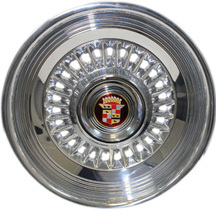 Small center cap with exposed lug nuts. 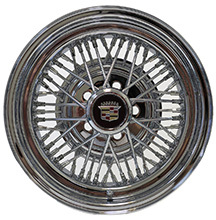 50 Spoke Truespoke Wire Wheels with Appliance Plating Caps and styling.